A value priced step-up sax. Thanks to the Allora Vienna Series Soprano Saxophone, musicians on a tight budget can still get a quality sax. This curved Allora soprano sax produces a very warm and even sound, making it ideal for musicians who perform in a concert band. A great value for schools on a budget as well as individuals looking for an affordable step-up instrument, Allora Vienna Series soprano saxophones combine features that enhance sound with others that increase durability. You'll find that the Allora Vienna saxophone is made so that it is amazingly easy to play the entire range. Key noise is minimal even at faster tempos and tone quality is excellent. Allora Vienna Series saxophones will give performers years of service. Like every Allora instrument, the Vienna Series saxophone is subjected to an exclusive play test and a shop check before it is shipped to you. You're assured of getting a great-playing horn. Great for an intermediate performer, the Allora Vienna saxophone is enhanced with decorative floral engraving on the bow and bell and is available in an optional silver-plated matte finish. Allora enhances the saxophone's value by accompanying your Vienna soprano sax with a soft carrying bag. With their combination of attractive price and robust performance, Allora Vienna saxophones are the horn solution many intermediate performers have been looking for! 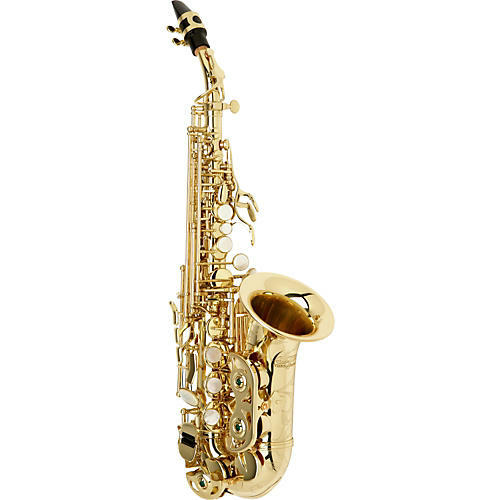 An affordable sax for the serious student.